Panel molding is the perfect complement to our line of crown moldings. When used together they combine to create a unified designer look to your room. What crown does to the ceiling; panel moldings do for the walls. 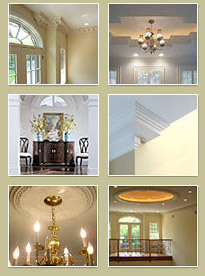 Panel molding visually enhances the room's sense of space. Choose from simple classic corners or the more detailed acanthus corners.